The Cook's Tour: Food.Baking.Travel. : A Winter Escape to Costa Rica and Panama! A Winter Escape to Costa Rica and Panama! Bye-bye zero windchills, gray days, and Uggs! Hello 85 degrees, sunny days, and flip flops! We just returned from a 10 day trip to Costa Rica and Panama, traveling most of the time aboard the Safari Voyager (part of the Uncruise fleet). Pura vida! Everywhere you go in Costa Rica, to almost any question you may ask, the answer is almost always “pura vida!” This is the Costa Rican version of “don’t worry, be happy!” It means “pure life,” and the friendly people of this tropical nation live it every day. They abolished their military in 1949 and since then invested those monies in healthcare and education for their citizens, providing free healthcare and free college education. Costa Rica has a 96% literacy rate, the highest in Latin America. Before we boarded the Explorer, we spent a day sightseeing with Costa Rican Trails from our base in San Jose. En route to our day’s destination, our tour guide suddenly told the van driver to pull over — he had spotted a sloth high up in a tree! Our little group quickly clamored out of the van & raced over to the tree where, indeed, a sloth was hanging in the branches. For creatures that are advertised as notoriously slow, this guy could move! It wasn't easy trying to get a good shot of him/her, but this one isn't bad. For me, on day one, to see a sloth in the wild was the highlight of the trip. How our guide managed to see this adorable creature as we were driving, I’ll never know! We spent the next couple of hours touring the Doka Coffee Plantation, one of the largest growers of coffee beans in Costa Rica (of course, we brought some home) Afterwards, we visited the beautiful La Paz waterfall gardens and wildlife refuge. This was the only rainy day of our otherwise HOT and sunny trip. Coffee beans ready to ship. Once we boarded the ship and met the crew and our 60 shipmates, our official adventure began. The week was filled with snorkeling, hiking, more incredible wildlife sightings (iguanas, Capuchin and Howler monkeys, sea turtles, dolphins, crocodiles (!) and bird species too numerous to name), and to cap off the week, transiting the Panama Canal. Resident of the aptly named "Isla Iguana"
The original canal opened in 1914 and it is an engineering marvel. When you think about the sheer enormity of the effort to join the Atlantic and Pacific oceans without today’s technology, it is a true testament to human ingenuity. France was the first country to begin building the canal, however, due to rampant disease and financial troubles, it was soon disbanded. 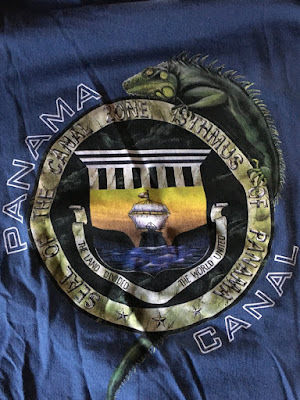 Once Panama obtained its independence from Colombia in 1903, they reached an agreement with the United States for the construction of the canal. It was finished on August 15, 1914, and the US managed it until 1999. 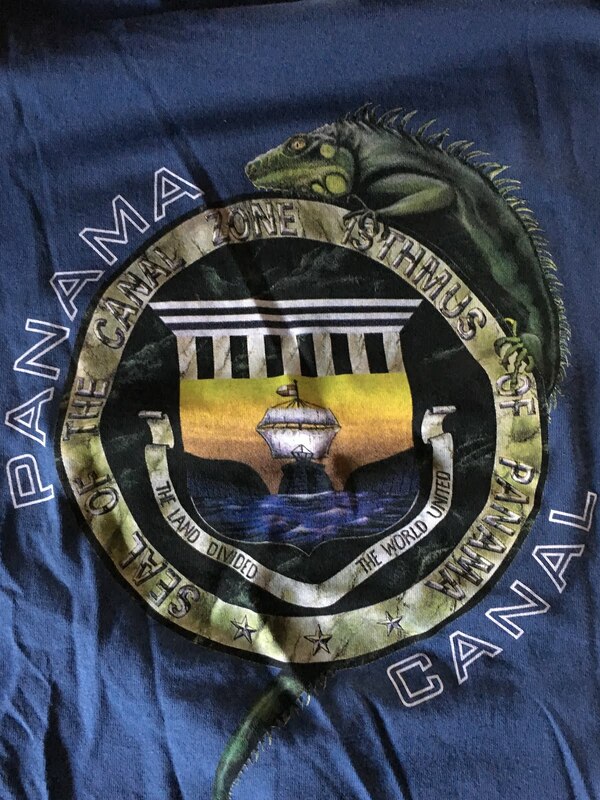 After that, Panama took over full operation and it is managed today by the Panama Canal Authority. The canal is a critical shortcut to save time and money in transporting goods around the world. As of September, 2010, one million ships had transited the canal. The demand for world maritime trade was so great that the canal authority realized expansion was needed. Thus, in 2007, the canal expansion project began. Another huge undertaking, but this time modern technology was employed. In addition, social and environmental impact studies were included to ensure that wildlife, reforestation, archaeological, and paleontological issues were considered. The expansion, which has doubled the canal’s capacity, cost upwards of $5 billion and created over 30,000 jobs. It officially opened in June, 2016. Through a series of locks that raises and lowers ships from sea level to the level of Gatun Lake (26 meters above sea level), to allow the crossing of the Continental Divide, and then back down to sea level on the other side, the crossing is quite the event. The crossing itself takes hours, and small ships like the Safari Voyager go through at night. When you begin the access, everyone gathers on the top decks, drinks in hand, to witness the passage. As we made our way toward the Bridge of the Americas (which connects both North and South America), Cunard’s Queen Elizabeth was exiting. That’s one BIG ship! On the deck for the crossing! The ship’s culinary team knows everyone wants to see as much of the crossing as possible, so they set up a terrific outdoor buffet (all other dinners on the cruise are plated table service) to allow guests the freedom to eat outside.